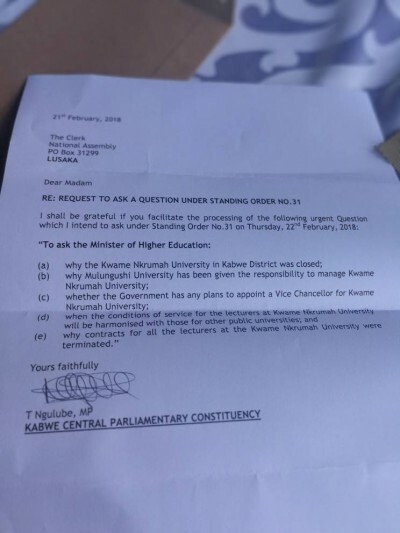 Kabwe Central PF Member of Parliament Tutwa Ngulube has filled in a notice of urgent question to ask Minister of Higher Education Prof Nkandu Luo five questions relating to the closure of Kwame Nkrumah and other public Universities. On Tuesday 20th February Tutwa Ngulube rose on a point of order as to whether Prof Luo was in order to remain quiet and not inform the nation why Nkrumah University and all public universities were closed. In his ruling Speaker of the National Assembly Dr Patrick Matibini directed Ngulube to file an urgent question so that other members of the house participate in asking questions to Prof Luo. The questions listed in the letter obtained by the Watchdog and attached here will be tabled on the floor of the house tomorrow Thursday 22nd February 2018. Among the questions is why the contracts for all lecturers at Kwame Nkrumah University were terminated.